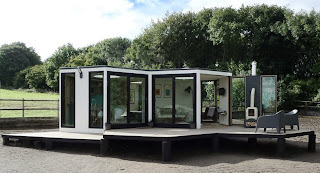 Being introduced in the UK, the Hivehaus, a prefab SIP house that is sure to be embraced by the West Coast crowd, is comprised of as many or as few cells as needed, with the ability to begin with a single-celled space that can be expanded on as required. Each cell provides 100 sq ft of floor space, enclosed by floor and walls made of 3.93 inch insulated timber frame SIPs with primed medium-density fiberboard (MDF) for the internal panels and Oriented Strand Board (OSB) on the outer. For insulation, the inner and outer panels are bonded with polyurethane foam, while "powder coated steel facing laminate" on the outside provides a shield from the elements. The cells are fitted with double- (with the option of triple-) glazed black aluminum composite doors and windows. The roof made from glass-reinforced plastic (GRP) fiberglass with polycarbonate dome skylights offers additional natural light. The cells are entirely self-contained and include six LED down lights and four double 240 V electrical sockets. Off-grid power solutions including solar panels are available, along with composting toilets and rainwater harvesting. 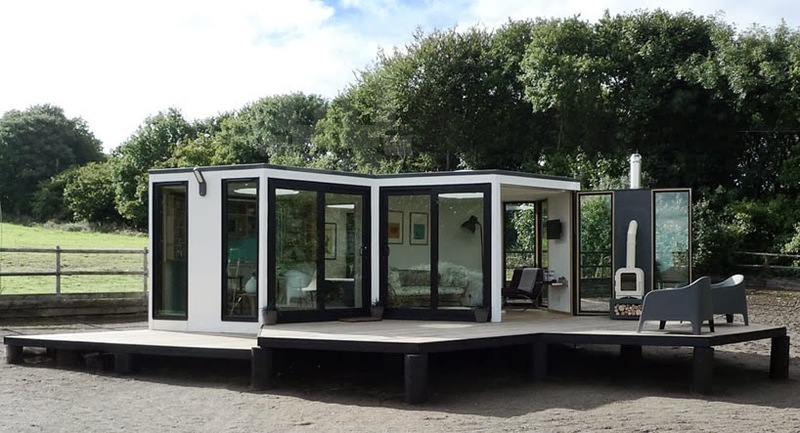 Optional extras for the Hivehaus include additional windows and skylights, exterior decking, kitchen, heating, such as wood burning stoves, and disabled access. All of this sits atop a lightweight steel frame which is supported by adjustable zinc-coated steel base jacks – useful for Hivehaus owners building on uneven terrain. If everything goes right, expect to see it available in the UK in 2014 and it’s only a short trip over the pond to the US where I’m sure someone will think that this is the answer to housing’s problems here. Perfect for the SoCal worker bees.